Valentines Day weekend didn't bring romance to Camp Wawona but it did bring extra help in the form of Anthony White. White, who has been a summer camp staff since 2007, took a year off to serve as a student missionary in the Galapagos Islands where he contracted a tropical illness after only 2 months of service. When the situation didn't improve, White was forced to seek medical treatment in the U.S. and could not return to the Islands due to mishandled paperwork by the institution he was serving. Wanting to finish the year of service he had started, White contacted Camp Wawona to inquire about filling the void left by Mary Ellen Barlow's early departure to prepare for medical school. 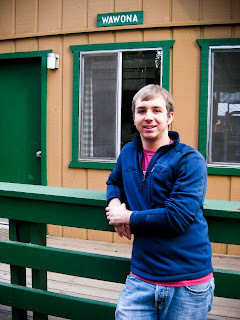 After much prayer and waiting, White arrived at Camp Wawona on February 14, 2010. White assist in teaching classes for Camp Wawona Outdoor School's pilot season as well as organize Year-Round and Summer Camp marketing (among other things). Camp Wawona is excited to add Anthony White to the Year-Round staff as they seek to grow in ministry and advance God's kingdom.